In Friday night’s conference opener against Texas, Wade wanted to be good. 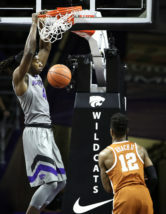 The sophomore forward scored 18 points, helping K-State to a 65-62 victory over the Longhorns. Neither team will look upon this game as a highlight of the season, at least offensively. Both squads suffered droughts of at least seven minutes without a field goal. But K-State (12-1, 1-0 Big 12) was able to heat up in certain stretches. Texas (6-7, 0-1) was not, until late in the game, when the Longhorns rallied to make things interesting in the final minute. Texas jumped out to an early seven-point lead in the first three minutes of the contest, thanks to its physical defense and rebounding. When K-State started to match the Longhorns in those areas, the game changed permanently. Wesley Iwundu added 16 points for the Wildcats, while Kamau Stokes logged 15 points and six assists. The lead grew as large as 13 with 7:23 to play. A pair of Wade threes fueled the run that gave his team a cushion. K-State didn’t get any contribution from its bench — zero points — but countered it with a solid effort at the free throw line, making 26 of 33. The Wildcats also made nine of their final ten to close the game. A much tougher test awaits K-State as Weber’s team will head to Lawrence to play No. 3 Kansas next Tuesday.